(Nanowerk Spotlight) Science fiction style robots like Star Wars' R2-D2 or the NS-5 model in I, Robot firmly belong into the realm of Hollywood – and so do "nanobots" à la Michael Crichton's Prey. Staying with both feet firmly on scientific ground, robotics can be defined as the theory and application of robots, a completely self-contained electronic, electric, or mechanical device, to such activities as manufacturing. Scale that robot down to a few billionth of a meter and you are talking nanotechnology robotics; nanorobotics in short. The field of nanorobotics brings together several disciplines, including nanofabrication processes used for producing nanoscale robots, nanoactuators, nanosensors, and physical modeling at nanoscales. Nanorobotic manipulation technologies, including the assembly of nanometer-sized parts, the manipulation of biological cells or molecules, and the types of robots used to perform these tasks also form a component of nanorobotics. Whether this will ever happen is hotly debated – to understand where both sides stand, read the famous 2003 debate where Drexler and Smalley make the case for and against molecular assemblers. Today's nanorobotics research deals with more mundane issues such as how to build nanoscale motors and simple nanomanipulators. Nanotechnology robots are quintessential NEMS (nanoelectromechanical systems) and raise all the important issues that must be addressed in NEMS design: sensing, actuation, control, communications, power, and interfacing across spatial scales and between organic and inorganic materials. Due to their size, comparable to biological cells, nanorobots have a vast array of potential appplications in fields such as environmental monitoring or medicine. "Ultimately, one of the most important applications of nanorobotic manipulation will be nanorobotic assembly" Bradley J. Nelson explains to Nanowerk. "However, it appears that until assemblers capable of replication can be built, the parallelism of chemical synthesis and self-assembly are necessary when starting from atoms." Nelson is Professor of Robotics and Intelligent Systems at ETH-Zürich and is the director of IRIS, ETH's Institute of Robotics and Intelligent Systems. He is also the author of the "Nanorobotics" section in the 2006 second edition of the Springer Handbook of Nanotechnology . The positioning of nanorobots and nanorobotic manipulators depends largely on nanoactuators, i.e. nanoscale devices that create mechanical motion by converting various forms of energy to rotating or linear mechanical energy. "During the design of an actuator, the tradeoffs among range of motion, force, speed (actuation frequency), power consumption, control accuracy, system reliability, robustness, load capacity, etc. must be taken into consideration" says Nelson. While nano-sized actuators for nanorobots are still under exploration and relatively far from implementation, microelectromechanical system (MEMS)-based efforts are focused on shrinking their sizes. The various nanoactuation principles include electrostatics, electromagnetics and piezoelectrics (see our recent Nanowerk Spotlight "Nanopiezotronics - a pathway to self-powering nanodevices"). With the invention of the scanning tunneling microscope in 1981 at the IBM research laboratory in Zurich, Switzerland, began the development of a series of scanning probe microscopes (SPM), based on different physical principles, that allowed scientists not only to look at nanoscale objects but also to touch and manipulate them. Atomic Force Microscopes, Scanning Tunnelling Microscopes as well as other SPMs and optical and magnetic tweezers are now used extensively for positional and/or force control at the nanoscale. This process is called nanomanipulation. A nanomanipulation system generally includes nanomanipulators as the positioning device, microscopes as 'eyes', various end-effectors including probes and tweezers among others as its 'fingers', and types of sensors (force, displacement, tactile, strain, etc.) to facilitate the manipulation and/or to determine the properties of the objects. 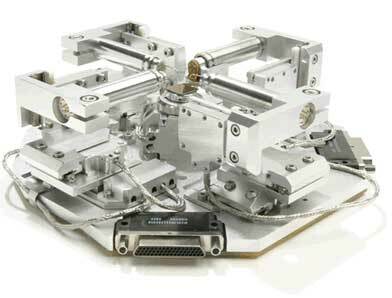 Example of a nanorobotic manipulator that features up to four positioners that grasp, move, test, and optimally position micro- and nanoscale samples with four axes of movement. Three basic types of nanomanipulation processes are performed: Lateral non-contact nanomanipulation (sliding); lateral contact nanomanipulation (pushing/pulling); and vertical nanomanipulation (picking and placing). The choice of which process to use is dependant on the environment (air, liquid, vacuum), the properties and size of the objects and the observation methods. "Nanomanipulation is a promising strategy for nanoassembly" says Nelson. "Key techniques for nanoassembly include the structuring and characterization of nano building blocks, the positioning and orientation control of the building blocks with nanoscale resolution, and effective connection techniques." A controlled nanoassembly requires two basic abilities: to anchor a nanoscale structure in a defined location, preferably without anchoring every molecule, and to assemble and chemically couple molecules between anchor points in three dimensions with full position and orientation controls. One example for effective 3-D nanorobotic manipulation is the structuring and assembly of carbon nanotubes into nanodevices. Nelson cautions that, "at present nanomanipulation is still performed in a serial manner with master?slave control, which is not a large-scale production-oriented technique. Nevertheless, with advances in the exploration of mesoscopic physics, better control of the synthesis of nanotubes, more accurate actuators, and effective tools for manipulation, high-speed and automatic nanoassembly will be possible." "Many in the field believe that one future for nanotubes will be as digital electromechanical logic elements in future computers" says Nelson. "There are genuine benefits over silicon, but there is a lot of work to do to get there. Our recently published work on batch fabrication of carbon nanotube bearings using dielectrophoretic directed self-assembly is one possible avenue, but there are other promising approaches, such as John Rogers' work at the University of Illinois at Urbana-Champaign on growing CNTs on quartz substrates (see our Nanowerk News article: "Linear arrays of nanotubes offer path to high-performance electronics"). It is certainly an exciting time to be working in this field."